Who is Darth Vader? How does he become a Sith? Why does he wear a mask? Perfect for children who are new to Star Wars and also for young fans of the movies, this exciting guide will answer these questions and many more and teach children fun facts about Sith Lord Darth Vader - including his amazing battles with rebels and Jedi heroes Obi-Wan Kenobi and Luke Skywalker!Follow Vader's journey from Jedi Knight Anakin Skywalker to the dark side of the Force alongside Darth Sidious. Discover what Force tricks Vader uses, who he works for, which lightsaber he uses, and what planet his secret base is on. 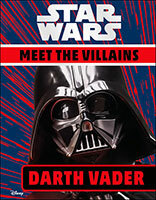 Featuring a simple Q&A format and exciting images, DK's Star Wars Meet the Villains- Darth Vader is a fun, welcoming introduction to the infamous Sith Lord as children follow his adventures in a galaxy far, far away. With colourful movie stills from the original trilogy, prequels and the latest sequels, DK's book allows children to explore Darth Vader's villainous world. & TM 2019 LUCASFILM LTD.Who is Darth Vader? How does he become a Sith? Why does he wear a mask? Perfect for children who are new to Star Wars and also for young fans of the movies, this exciting guide will answer these questions and many more and teach children fun facts about Sith Lord Darth Vader - including his amazing battles with rebels and Jedi heroes Obi-Wan Kenobi and Luke Skywalker!Follow Vader's journey from Jedi Knight Anakin Skywalker to the dark side of the Force alongside Darth Sidious. Discover what Force tricks Vader uses, who he works for, which lightsaber he uses, and what planet his secret base is on. Featuring a simple Q&A format and exciting images, DK's Star Wars Meet the Villains- Darth Vader is a fun, welcoming introduction to the infamous Sith Lord as children follow his adventures in a galaxy far, far away. With colourful movie stills from the original trilogy, prequels and the latest sequels, DK's book allows children to explore Darth Vader's villainous world. & TM 2019 LUCASFILM LTD.